To access the Sousa Archives Digital Library, please follow the Digital Library link. Throughout 2014 the staff of the Sousa Archives and Center for American Music worked with William Brooks, Professor of Music at the University of York, and the University of Illinois Library’s Digital Content Creation, Content Access Management and Metadata units to digitize the WWI sheet music contained in our James Edward Myers Sheet Music Collection. World War I is considered by many music scholars to be the most musical war in America’s history. The music from this time was created by all sorts of Americans: professional songwriters, acclaimed composers, church musicians, well- and little-known performers, and uncounted singing teachers, small-town bandmasters, and amateurs. Their melodies and lyrics reflected various public perceptions of and responses to America’s evolving relationship with this War, and much of this music resonated local themes that were specific to communities, ethnic groups, or organizations. The WWI music contained in the Myers Collection documents not only what was produced by Midwestern publishers but also offers a compelling cross-section of popular musical practices and tastes across the Midwest between 1914 and 1918. The music, lyrics, and graphic art illustrations contained in this new online resource are intended to provide insights into American life during and after the War for students, teachers, and scholars interested in learning more about Midwestern perceptions of this military conflict. 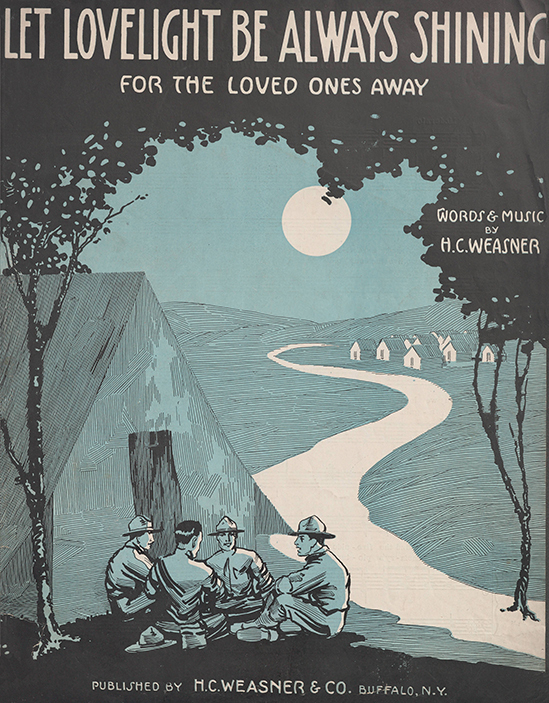 The James Edward Myers World War I Sheet Music Collection can be accessed here. We hope that you will take a couple of minutes to visit this site and dig deeper into the rich content of this significant resource. In addition you can also access the Newberry Library’s World War I sheet music contained in its Driscoll Collection of American Sheet Music here. For further information on the James Edward Myers Sheet Music Collection call 217-244-9309 or email the Sousa Archives. Visiting researchers must fill out a printed copy of the Research Registration Form prior to their appointment. Access to materials is conditional upon adherence to these rules. The archivist enforces the rules and is available to answer questions about handling, reproduction, and other uses of the collections. Researchers are not permitted in the stacks. Collections do not circulate and may not be removed from the reading room. Researchers are limited to one box on the table at a time. Maintain original order. Remove one item or folder at a time and flag its location with the markers provided. Work slowly and carefully to prevent records from being crumpled, torn, or broken. Rushing through archival collections endangers the materials. Return material to the box before leaving the reading room. Do not leave materials unattended. Initial your container list as you receive each box. No eating, drinking or smoking in the reading room. Photocopies and digital copies of materials held by the Sousa Archives and Center for American Music can be made available to individuals for the standard charges outlined in University of Illinois Library Universal Fee Schedule. These fees cover reproduction services only and do not provide copyright clearance, convey commercial use rights, or expand or limit the rights provided by the Fair Use provisions of the U.S. Copyright Code. The Sousa Archives cannot provide photographic prints from its collections, but these can be secured through a photographic finishing service. For those materials which the Sousa Archives holds the copyright to an additional fee will be charged if a commercial publication, broadcast, or performance is anticipated from these specific duplicated materials from the Sousa Archives collections. A full schedule of duplication fees may be downloaded from here. Questions regarding duplication requests should be sent to the Director of the Sousa Archives and Center for American Music. Tours are offered daily during regular Center hours. Individuals may request tours, as may larger groups such as university classes, nursing homes, and school bands. Special tours outside of regular hours are available upon request. To ensure there are staff available for your tour, please make an appointment ahead of time, especially if you plan on bringing a large group. To schedule a research appointment, please fill out our appointment form.